rocky's bru: Pakatan MPs want to boycott Parliament, izzit? "If a member has not taken his seat within six months from the date on which the House first sits after his election or such further time as the House may allow, his seat shall become vacant." 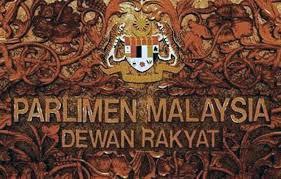 So, yer buggers (ybs) we Malaysians elected just last month and are now threatening to boycott the Dewan Rakyat session, please make sure you stay away long enough to earn automatic diisqualification. Don't be wimps, ybs. Go all the way. For context, read Anwar MAY boycott Parliament's Opening Session. also, Now Anwar is "mulling" over whether to betray his electors. Excerpts: "At the opening session of Parliament, 222 members are due to be sworn in. They will do so because they were elected and they believe in our system of government. Don't be surprised if even Anwar takes his seat that day because he, as much as anyone else, knows how silly this boycott idea is." p.s. The opening session of the 13th Parliament is 24 June 2013. Mark it on your calendar, bros and sis, coz we are going to watch these drama kings and queens who said they'd boycott the session come to be sworn in. And remember this: once they take the oath, they are deemed to have accepted the results of the 13th General Election. lol ... that would be cool. Harap - harap Najib jangan jadi wimp keluarkan statement memujuk la apa la. Tell us which part of the Constitution says that a person can be FIRST sworn in as minister and THEN as Senator? Ramalan sya tepat sekali, pasti ramai dari kalangan mereka tak fasih dlm Bahasa Kebangsaan, (check their SPM/MCE BM results) ... habis tu macam mana nak berdebat? And this Pakatan, they simply pluck candidates from god know where, Rocky, please make background search on them.. very suspicious! Yg pandai BM pulak berbakat melalak tepi jalan aje. Yeah if they rally "anak jantan" they should stay away long enough, so they could be disqualified. The rakyat like to see if there is true "Jantan" among the Pakatan or they are just pondan pretends to be jantan. No sweat la Parameswara, revoke the ministerial appointment, then reappoint. No stupid byelection needed, you nincompoop! Boycott? Well.....those are not lawmakers as they suppose to be at the first place. They don't have the honor of being one. What they knew was politicking everything.....and that is the only thing in their mind. Rakyat? Forget about it! Politics? Yes. Work for voters? Err.....not in their vocabulary. Parameswara: the question should be which part of the Contitution says that a person CANNOT be first sword in as Minister and then as a Senator. Anwar is not a trustworthy political leader and his words are never committed. This is not an accusation but a fact of the truth that whatever Anwar had promised or stated in public since he was ousted from the government in 1998 had never been honored. Therefore, I do not think that Anwar is willing to sacrifice his elected position as the MP for Permatang Pauh when parliament is officially convened on 24 June. Pakatan is not jointly committed to boycott parliament as both DAP and PAS as well as the opposing faction in PKR have yet to support Anwar's stand in the matter. In the same context, both DAP and PAS as well as the silent majority in PKR are against the current rallies and demonstrations organized by Anwar and his political cronies in some of the extremist NGOs. We wish to believe that Anwar will go ahead to boycott the parliamentary swearing in ceremony on 24th June and also to stay away as a "fugitive elected MP" as long as six months in order to disqualify himself as the designate MP which will result in a by election. Let's see whether Anwar's threat to gather at least 30 opposition elected MPs will join in the frail and thus making a mockery of the inauguration of the next parliament. Please boycot the upacara angkat sumpah. Please la Anwar and all PR gang.. Boycott the parlimentary session, the DUNs if you guys really have integrity and stand by what you claim, that the GE13 was illegal. If not you all are just a 'team of incompetent '. Kalau sipenipu tidak bermoral itu suruh telanjang semasa angkat sumpah pasti MP pembangkang semua membabi buta ikut. This is what you get when you vote in the rebels. They will proudly display their stupidity to please the clueless voters. Anyway, if they want to boycott Parliament, by all means please go ahead. It will be very peaceful without these brainless rogues. These useless idiots should also boycott their own party elections which is tainted with massive and blatant cheating. They also never used indelible ink when they rigged their own party elections. In fact, if they decide to burn themselves or jump from the Penang Bridge, the world will be a better place to live in. My dear elected reps, please come back to your senses. You were voted in because you are the servants of the public, paid for by the public to look after your constituent. In your manifesto, you did not promise to run amok or did you? So, if you want to be a public burden, please resign. Many others can do a better job than you usless rebels. By the way, have you figured out how you are going to repay your debts to your foreign masters? If 'sword' in, one must be then alive to become Senator! And I like the idea by Anon 11.35pm - revoke the ministerial appointment, then reappoint. So easy as that ah? Tak payah nak fikir panjang lebar, nak boikot inikali teruskan aje! Sesiapa parliament boleh diteruskan tanpa kehadiran mereka dari PKR. Jika Anwar dan kroni nya tidak percaya kepada keputusan rasmi PRU13, mereka boleh mengembalikan kerusi MP mereka supaya EC boleh mengadakan Pilihanraya kecil di kawasan-kawasan yang tertentu. Permainan politik di Malaysia memang unik, seorang isteri yang telah dipilih oleh rakyat di Permatang Pauh boleh meletak jawatan nya untuk memberi laluan kepada suami nya yang sudah beberapa tahun meninggalkan kawasan yang tersebut. Undang-Undang khas perlu diuabah supaya pisang tidak berbuah dua kali. Bagaimana pula jika ditakdirkan Anwar bercuti di Sungai Buloh sekali lagi dan inikali isteri beliau akan bertanding di Pilihanraya kecil di Permatang Pauh? Boleh ke inikali isteri mengantikan suami? Sbelum mereka masuk majlis angkat sumpah bole tak Rocky interview mereka LIVE for all to see, dalam Bahasa Kebangsaan? Nak tengok sikit fasih ke tidak.. satni jadi MP tak tau communicate dlm Bahasa Kebangsaan, macam mana nak represent the rakyats? Yang pelat2 ala Tongkang pun tak mau ya! Memalukan..
... another episode of Anwar Aljuburi "sandiwara." Rakyat yang pilih merekalah bodoh ! Aiyaa Rocky pun tak suka BM kan sebab itu dia suka PPSMI...sikalang cakap fasat BM pula..
boycott the opening session... and why not ? when there are 5 illegal ministers & deputy ministers in the house. In my earlier posting, I have expressed my thoughts on the impending boycott of PKR elected representatives, not only in parliament but also in DUN. If PKR is serious in maintaining their integrity to boycott parliament and DUN, then they should do it not only at the swearing ceremony but also to resign from all their state Exco posts. Today, they were conspicuously absent at the parliamentary briefing for all newly elected MPs but had not caused any parliamentary breach. It is their wish to boycott but not their right to boycott against the wishes of the voters. In the same context, elected MPs of PKR should continue their boycott up to 6 months in order to force the by-elections in all those seats to be vacated. It's up to the people to decide on their political fate nod future and not just observers from other interested party. Anwar will be there....just talking rubbish as usual!